A couple of weeks ago, a friend of mine and I went to see The Who play at the Izod Center (formerly Continental Arena, formerly Brendan Byrne Arena). It was almost 26 years to the day since we had last seen The Who at the same venue on their farewell tour. In 1982, Keith Moon was dead and Kenney Jones was gamely filling in on the drums. Jones was a fine drummer, but no Keith. This time around, John Entwistle was also gone, replaced by Pino Palladino, also a fine bass player (no Entwistle, but who is?). The fact that it was “Half The Who” was on our minds as we sat in the parking lot, drinking a cold beer (or two…or three). We started talking about how many of the old bands were nearly gone now. Levi Stubbs of the Four Tops had died not too long beforehand, leaving only one remaining original member of that great vocal group alive. I asked the question, “Are any of the old bands gone?” We couldn’t come up with any. The Ramones have one surviving member, the Beatles and Who have two, Badfinger has one, the Mamas and Papas have one. Stunningly, the Stones have lost only one original member, and it isn’t Keith Richards. Sooner or later, we reckoned, one of these bands would be entirely gone. Unfortunately it happened sooner, rather than later. Last week the news came through that the sole survivor of The Jimi Hendrix Experience, drummer Mitch Mitchell, had been found dead in his hotel room, after playing on a tour called Experience Hendrix with guys like Johnny Lang and Kenny Wayne Shepard filling in for Jimi. Jimi, of course, was the first to go, in 1970 at the age of 27. Bassist Noel Redding made it to 2003 before dying. On November 12, 2008 it was Mitchell’s turn. In the grand scheme of events, I’m well aware how unimportant a rock drummer is but for music geeks, like myself, this was like watching a part of history die. The days when these musical colossi roamed the Earth used to seem so recent. Now it suddenly seems like just another bygone era, somewhere between the Victrola and the iPod. It’s one thing when a towering solo superstar dies. Death can come at any time and claim an Elvis, an Otis, a Buddy. This was an entire band, though. They once stood on top of the world as a collective unit and now they are nothing but memory. In this spirit, allow me to express a word or two of appreciation for Mitchell. His name is not as well known as Keith Moon or John Bonham, but Mitchell was nearly as fiery a drummer. A jazz freak, he brought a distinctly Elvin Jones-ish feel to rock drumming. Prior to guys like Moon and Mitchell, rock drummers kept the beat and threw in a few fills here and there. Moon exploded the concept by playing lead drums, arms pinwheeling, drumsticks twirling, his kit laced with explosives. Keith was a show unto himself, and he placed the drummer at the front, equal in every way to the guitarist and the singer. Mitchell (who auditioned for The Who but lost out to Moon) took a more traditional role. There was no way to share the stage equally with Jimi Hendrix, and Mitchell knew it. While he contented himself to remain a supporting player, he brought that jazz style to Jimi’s Martian blues and psychedelic excursions. Rolling around the toms, Mitchell sounded like a rumbling deep inside the earth. While Jimi kissed the sky, Mitchell shook the ground. You may have been so busy reaching for the clouds with Jimi that you didn’t notice what else was happening, but a large portion of the sensory overload that was the Experience came from the back. Mitchell was technically a better drummer than Moon, though not as influential or as much fun to watch, but he served the same purpose in the Experience that Moon served in the Who. If you watch old footage of The Who you’ll notice something strange. During guitar solos, instead of stepping forward and taking the spotlight like a good lead guitarist, Pete Townshend would frequently step back until he was next to Moon. He’d put his head down, sometimes even put his foot on the drum riser…and Moon would spur Townshend on, and Townshend would inspire Keith to new heights, like two parasites feeding off each other. Mitch Mitchell did the same thing for his lead guitarist. Jimi Hendrix never shunned the spotlight but, like Pete and Keith, Hendrix would lock in with Mitchell and the two of them would become an unstoppable force, a blinding blizzard of technical proficiency and deep soul. Mitchell was the perfect drummer for Hendrix, which explains why Hendrix went back to Mitchell after the Band of Gypsys experiment. As Hendrix played the role of alchemist, turning noise and distortion into cosmic beauty, Mitchell kept it all rooted with those endless rolls across the kit, as relentless and as powerful as the ocean. Mitchell’s skill made Hendrix better; Hendrix’s genius spurred Mitchell on to ever greater heights. Together they spiraled up into the stratosphere, like a rocket kept on course subtly and capably by Noel Redding’s bass, I frequently wondered what Stevie Ray Vaughan would have sounded like if he had a Mitch Mitchell behind him rather than the lead weight of Chris Layton. It would have been amazing. Compare Hendrix’s version of Earl King’s “Come On” with Stevie’s version of the same song to hear the difference a drummer can make to a guitar player. So there it is. The first (as far as I can tell) of the great Sixties bands to become extinct. The next ten to twenty years will see many more. 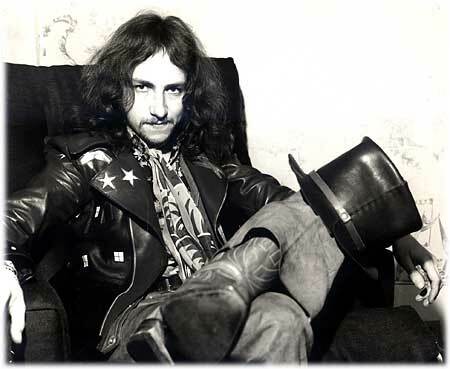 Mitch Mitchell, dead at 62. RIP. Update: As if you needed another reason to appreciate that The Raconteurs are the coolest band on the planet right now, they have replaced their usual website home page with a great picture of Mitch Mitchell, which I have ruthlessly appropriated below. Gotta love this band…they know their history.